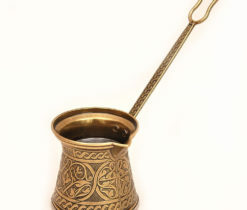 View cart “Handmade Turkish Coffee Espresso” has been added to your cart. 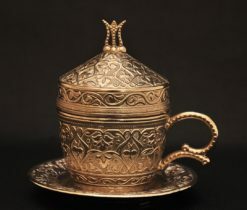 Coffee has firmly entered our lives long time ago. 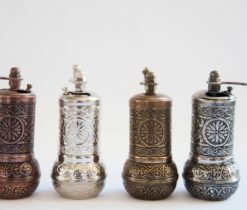 Drinking it from ordinary cups is not so convenient, it is better to buy a special set for making coffee. 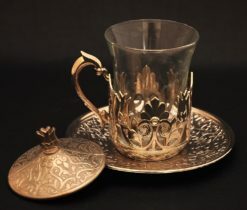 Beautiful, elegant, light, made in different styles, coffee set is sure to be a decoration of the table. 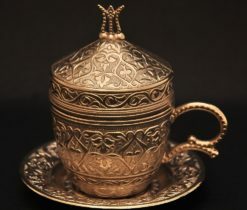 It can be made not only from classical porcelain, but also from the finest metal. 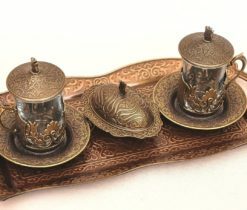 You do not have to waste time searching for coffee sets - our online shop has simplified this task. 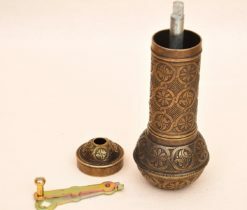 In Handicraft items for home you can buy various types of coffee sets. 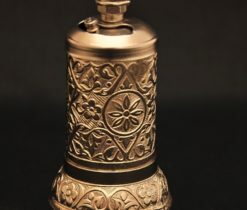 At the same time, each set for coffee is distinguished by its individuality and high quality. 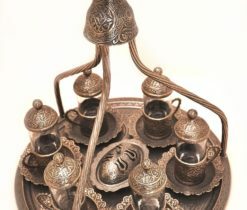 Turkish coffee set does not have holes in the spout, like a teapot, and has a fairly high shape. 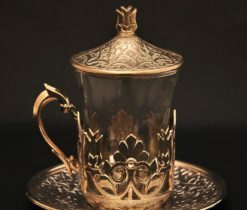 By thin and elegant spout of teapot the coffee is poured little by little and the teapot keeps coffee warm for a while. 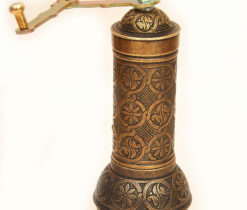 Also you may need Turkish coffee grinder which is the best hand coffee grinder that had ever been invented by a man. 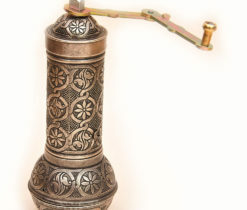 This device works independently of electricity, at the same time it is compact and does not take up much space in the kitchen. 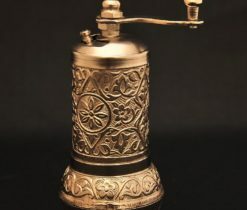 Coffee, ground on a qualitative hand-held coffee grinder, is as good as coffee, ground on a professional machine. 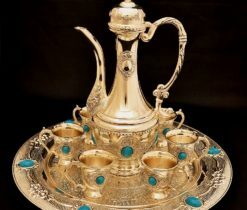 Also in our online-store you can find Arabian coffee set, oriental ornament of which is applied by craftsmen by hand, and each pattern and curl has its sacral value. 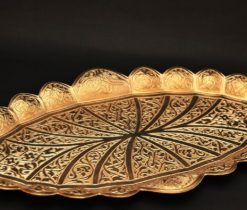 The sets are colored into golden and silver colors; they are very compact and moderately light. 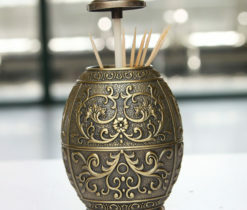 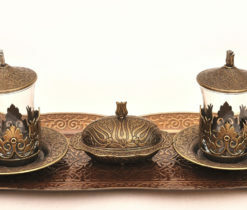 This set will serve as a wonderful souvenir brought from Uzbekistan. 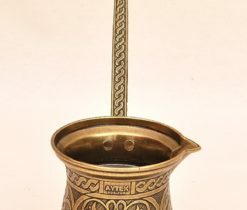 The oldest thing for brewing coffee in Europe was and remains a coffee pot. 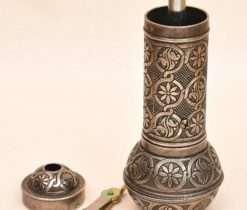 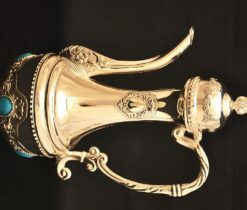 Some people still confuse the Turkish coffee pot with a simple teapot, but in the case of a coffee pot, the value of elongated shape and curved spout is in deposition of the coffee grounds to the bottom and impossibility of their penetration into the cup. 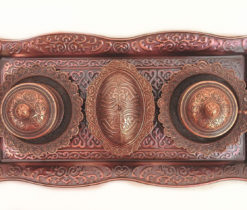 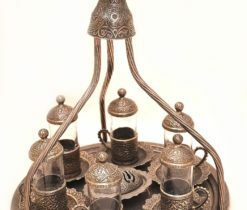 Copper Turkish coffee set - copper, in comparison with other metals, is known for its ability to evenly distribute heat and quickly carry it across its surface. 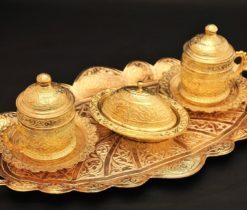 Brass coffee set is an exquisite tea coffee set, engraving of which is handmade, and it consists of several cups, sugar bowl and a tray. 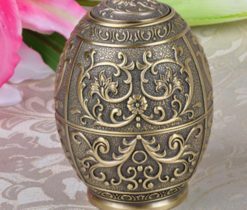 Elegant and colorful design will suit the taste of connoisseurs of the classics, and those who prefer refinement and sophistication. 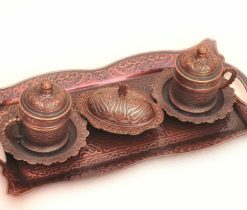 In our online-shop you will find Traditional, Oriental, Ottoman copper and brass coffee sets which will be a classy addition to your interior.